The next big project I’m working on is, tidily enough, its sequel. Book Two of the Power of Five series, Evil Star by Anthony Horowitz. 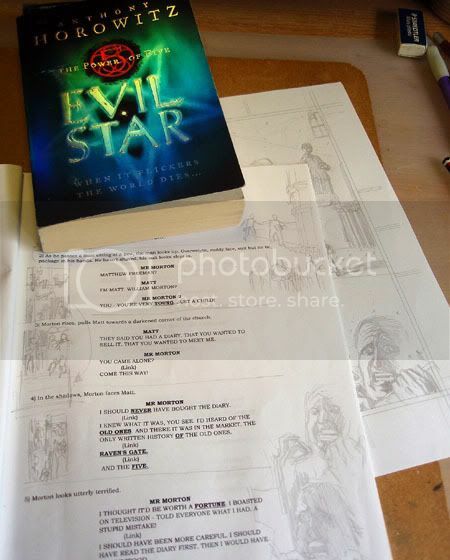 I’ll be the sole artist on this 171 page Graphic Novel adaptation of the original novel. Oh, and there’s a massive collaborative community artwork here, the result of James Harvey‘s ‘Choose a Cat, Draw a Girl’ 2010, with art from me and err, everybody else on the interweb. All of ’em! 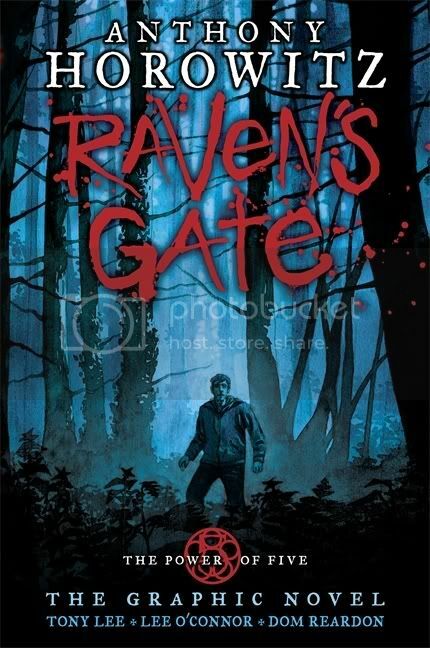 Raven’s Gate – Out Today! Chuffin’ nice, eh? It’s got 170 story pages wrapped in lovely design by Patrick Insole at Walker Books and a beautiful cover with spot embossed gloss inks. Thinking about it, given the supernatural nature of this title, we might even see a bit of cross-over from the Twilight crowd and those ‘Dark Fiction’ shelves that groan with vampire novels in the bookshops… We shall see! I really should get around to bleating about the next book with m’scribbles in that’s going to be on the shelves. 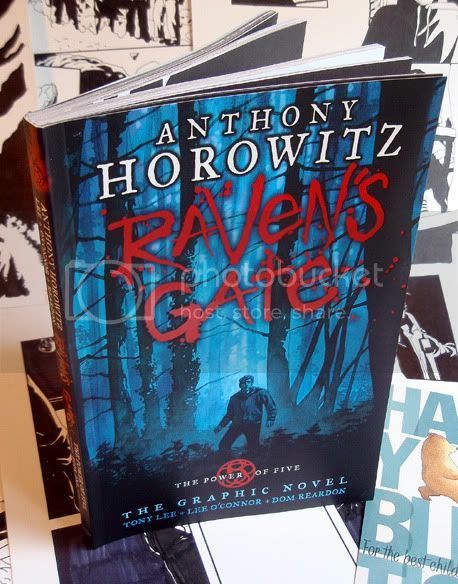 I’m not entirely sure how to attach the required level of fanfare to announcing something as high-flyin’ as this, but let’s just say it’s a Graphic Novel adaptation of author Anthony Horowitz‘ novel Raven’s Gate. It’s going to be published by one of the most well-established publishers of kids and young adult books in the UK: Walker Books. 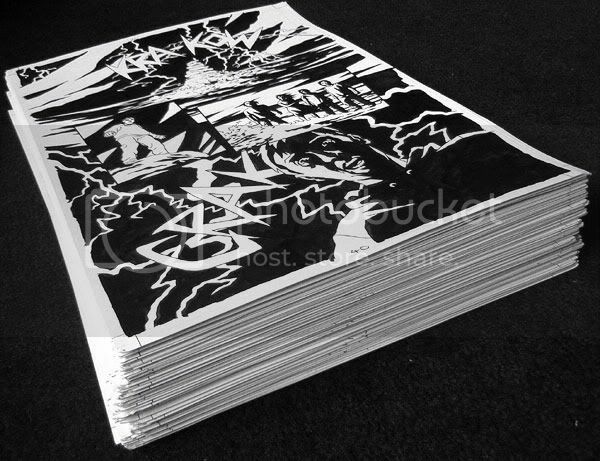 This intimidating edifice here is the stack of all the inked original artwork (minus the first 39 pages, Dom’s got those!) You might have noticed (and if you did notice then I think you seriously need more excitement in your life) there have been some points when this blog’s been a bit quiet over the last year plus. Well, here’s the culprit. Oh, and the first page on the top there is me having the pleasure of inking some of Dom’s pencils..! Mmm. The text was adapted by Tony Lee, and the fact the (eventual) book’s coming out from Walker means that it’s actually going to bother your local bookshop. You know, where they sell proper books with just words in to normal people. Heavens! The thing’s going to be splashed across booksellers catalogues, the back pages of Anthony’s other series of novels, Alex Rider the schoolboy spy (There was even an Alex Rider feature film called Stormbreaker a few years ago with a stellar cast, y’know) and a few other places besides, so this is pretty serious business.